Dr. Jane Orient, executive director of AAPS, congressmen Dr. Burgess (TX-R) and Dr. Amerling testified last week before the House in support of freedom of choice for doctors and patients. This clip is just shy of an hour long but is well worth the time to watch. The PPACA is tragically misnamed: it neither protects patients, nor will it bring down costs. Entitlements are driving federal and state budgets over the cliff, and the PPACA adds significantly to the momentum.These three doctors provide explanations for why this is true. Today, this isolated [doctor-patient] relationship is no longer tenable or possible. Health care has become an industry, with numerous loci of authority well beyond the doctor’s office. In many ways, the relationship of the patient to the doctor is less important. Traditional medical ethics, based on the doctor-patient dyad must be reformulated to fit the new mold of the delivery of health care. In place of a direct doctor-patient relationship, Berwick advocates (and the PPACA strengthens) our current dysfunctional third party payment system which places a bureaucrat into the middle of our medical decisions. More and more, doctors are being required to make treatment decisions based on population-based clinical guidelines rather than the customized needs of individual patients. Regulatory requirements are making it more difficult for physicians to survive as small businesses, driving physicians to either retire early or work as employees. It is possible that the physician-as-employee model is less expensive (which is not the same as more efficient or cost-effective,) but shifting to that model should occur voluntarily through a free market, not by the government stacking the deck against the option of private medicine. For more details on how the new health care control law will take away freedom of choice without solving problem of rising costs, watch the video clip below. If you prefer to read their statements instead of watch, you can find them here: Dr. Orient's, Dr. Amerling's. I don't have a link to Br. Burgess' statement, but he comes first in the video after a brief introduction by Dr. Orient. Randy Barnett was the speaker I came to hear at the recent symposium, Advancing Liberty, Creating Change, --and he did not disappoint. Mr. Barnett is a constitutional law professor, author of Restoring the Lost Constitution, argued before the Supreme Court in Gonzalez v. Raich (a key case in Commerce Clause precedent), written multiple amicus briefs in support of the unconstitutionality of the individual mandate, and is now the legal representative for the NFIB in the appeals case of Florida v. HHS (the same case in which Docs4PatientCare has filed an amicus brief). Barnett briefly summarized how the case against the mandate developed, illustrating how a small number of people can make a big difference. A conversation between Barnett and someone from the Heritage Foundation led to a paper on the unconstitutionality of the individual mandate. The paper was published just before the bill was passed Dec. 23, 2009, setting out the terms of the debate, and providing Senate Republicans with a basis to place on record a constitutional objection to the mandate. Currently, there are five individual mandate legal challenges on expedited repeal. The government has ramped up the seriousness with which it is defending the mandate by having the Solicitor General argue the case at the appeals level. This is a very unusual move as the government's top lawyer usually only becomes involved, if at all, when a case is before the Supreme Court. Barnett expects the cases on appeal will wrap up around August or September allowing for a petition to the Supreme Court in the fall. Oral argument would then be heard by SCOTUS in January of 2012 with a decision by the end of its term in June. You can read Barnett's estimate of how the judges may rule in his article Commandeering the People. At the reception after the talks ended, I spoke briefly with Mr. Barnett, thanking him for all of his work defending health care freedom. He recommended the ACA Litigation Blog as a good source of information for those interested in following this case closely. The site also has links to the official documents of the 5 legal challenges making their way to the Supreme Court. If you are interested in delving further into the constitutional issues, I would recommend starting with three documents: Judge Vinson's ruling of FL v. HHS (which provides a concise and cogent summary of the history of Commerce Clause cases), Barnett's brief to the 9th Circuit Court of Appeals (which presents the key arguments of the unconstitutionality of the mandate consistent with current legal precedent), and his article "Commandeering the People" which takes a closer look at the role of the Necessary and Proper Clause in light of the current constitutional debates. To rid ourselves of this onerous law, popular discontent must be the dominant mood of the country. To maintain discontent, we must avoid resignation by keeping the hope of affecting a change alive. 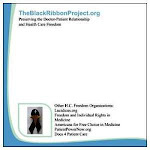 One way to do this is to announce to each other support for repeal by wearing or displaying the Black Ribbons. The more Black Ribbons that are out there, the more people can see they are not alone, that there is hope of change. Let's make a difference, now. You can cut spending and still get reelected. You can cut spending and the world does not fall apart. You can cut spending and grow the economy. As our Congress continues the Budget Debates, let's work to remind them that these truths will also hold for health care spending. Next, Adam Thierer spoke on the very important battle to preserve internet freedom. Although his talk was equally fascinating as the others, it wasn't as directly relevant to health care so I refer you to his written body of work for the details of his ideas. Adam was followed by Matt Mitchell, speaking on the growing problem of unsustainable trends in state government spending and debt. The two largest contributors to this problem are Medicaid and the effects of public employee retirement benefits. From his talk, I took away two key points. Unions in the private sector increase the wages of some workers at the expense of other workers, but are limited in what they can demand from their employers because of business' need to make a profit. (What came to my medical mind was the fact that a successful parasite doesn't kill off its host.) If profits decrease too much, the business (and the jobs) will disappear. Unions in the public sector don't have customers paying for goods and services--they have taxpayers, who can't choose to go away. Also, in the public sector, unions get to vote for and select the people with whom they negotiate for their benefits. In the private sector, unions don't get to vote for their employers (other than with their feet.) The fundamental incentives for public unions have no brakes. To improve the situation, we need to change the rules and alter the incentives. Tweaking the numbers will never be enough. With regard to Medicaid, Matt showed that the problem goes beyond the incentives for expansion that the current system holds. (Because of Federal matching funds which shift state costs to the country as a whole, States have the incentive to continually expand Medicaid programs.) He also pointed out that whenever government funds a program, it creates a powerful vested constituency which pushes for continued spending and expansion. Data shows that when the Federal government reduces payments for state programs--the programs don't shrink or go away. The states just continue to fund them through state debt or raising taxes. A looming danger of the PPACA is the enormous new entitlement constituency it creates, not only through the expansion of Medicaid, but also through insurance premium subsidies. The formal talks were punctuated with opportunities to talk personally with the speakers and fellow attendees. It was an exciting chance to meet face-to-face several people whose works I have admired from afar, or have met only in the cyber-world of Yahoo groups. In spite of the very real and significant challenge to individual rights which our country currently is facing, the general mood of the speakers and the audience was decidedly optimistic. I left encouraged and inspired, knowing that people of such intellectual caliber and integrity are fighting for the cause of freedom. Update: New paper out from the Mercatus Center-"Public Sector Unionism: a Reivew"
Patient Diana Hsieh relates her personal experience with a health problem to illustrate why "cookie cutter" medicine and government "quality control" through adherence to clinical guidelines is bad for your health. For a more technical discussion, don't miss the following posts by two practicing physicians who regularly blog on health care policy.